More than 30% of athletes competing at the 2011 World Championships admitted to using banned substances during their careers, according to a World Anti-Doping Agency-commissioned study. The figure was even higher, at 45%, when athletes at the 2011 Pan-Arab Games were asked the same question. 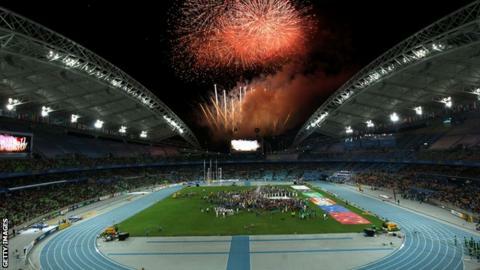 More than 5,000 athletes competed at the events and 2,167 were asked if they had taken banned drugs. "The true prevalence of doping remains unknown," the researchers said. Just 0.5% of doping tests at the 2011 Worlds in Daegu, South Korea - where every athlete was tested - were positive. In Qatar for the Pan-Arab Games, the figure rose to 3.6%. "The study shows that biological tests of blood and urine reveal only a fraction of doping cases," said Harvard medical professor Harrison Pope. "This is likely due to the fact that athletes have found numerous ways not to be caught during tests." The research was carried out by Germany's University of Tuebingen and Harvard Medical School in 2011. However, the team claimed the publication of their work had been delayed by talks with Wada and athletics' governing body the IAAF over how it should be published. Doping has overshadowed athletics in recent years following an investigation into a state-sponsored Russian doping programme which led to the country's track and field team being banned from the 2016 Olympic Games in Rio de Janeiro. Russian athletes taking part in the World Championships in London earlier this month were only allowed to compete as neutrals. A re-testing programme run by the International Olympic Committee to look at old samples using new methods has found more than 100 athletes used banned substances at the 2008 and 2012 Olympic Games.